Saints Row IV is on sale in the Gold Box today only. Play as the President of the United States in a story that spans countries, space, and time. You are the Super Hero-in-Chief – Leap over buildings. Kill people with your mind. Run through tanks. Those are some of the most mundane powers you will wield in your quest to stop an alien menace hell-bent on destroying the Earth. Looking for other video game deals, check out today’s lightening deals, all on video games today, CLICK HERE. Today only, enjoy huge savings on digital Harry Potter movies at Amazon Instant Video. Purchased videos will be stored in Your Video Library where you can access them whenever you want–stream them instantly and watch on your PC, Kindle Fire, PlayStation 3, or more than 300 HDTVs, Blu-ray players, and set-top devices. You can also check out new release movies and current TV seasons at Amazon Instant Video, or return to the Gold Box. $10 for an HDE 4GB USB Flash Drive in One of Six Designs. Shipping Included ($27.95 Value). 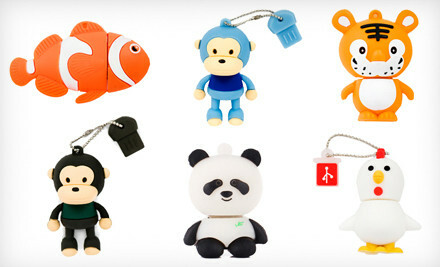 HDE’s USB flash drives safeguard digital media in decorative and protective rubber cases. Up to 4 gigabytes of files store safely inside stylish sleeping bags in the form of a monkey, tiger, goldfish, and other animal designs, making transporting information as much fun as sending Morse code via cup-and-string phone. Each drive is formatted with a FAT32 file system compatible with Windows, Mac, and Linux operating systems, as well as with PlayStation 3. $10 for an HDE 4GB USB Flash Drive in One of Nine Designs. Shipping Included ($19.95 Value). HDE’s USB flash drives safeguard digital media in decorative and protective rubber cases. Up to 4 gigabytes of files sleep inside stylish sleeping bags in the form of a ninja, ice cream bar, and football, making transporting information as much fun as sending Morse code via cup-and-string phone. Each drive is formatted with an FAT32 file system compatible with Windows, Mac, and Linux operating systems, as well as with PlayStation 3. Playstation Move Navigation Controller only $14.99!!! These controllers normally retail at $39.99, but you can get it today at 63% off and free shipping. Move into the game with more advanced control. The PlayStation Move navigation controller pairs perfectly with the PlayStation Move motion controller, providing advanced in-game character navigation in compatible titles. Actions and commands common in advanced gaming as well as menu navigation are integrated into one untethered, wireless package. It’s one of the most advanced controllers ever created, and it’s possible only on the PlayStation 3 system. Wireless control adding to, but completely untethered from PlayStation Move motion controller. Intuitive navigation of in-game characters. Easy and intuitive XMB menu navigation. Charge the controller and automatically pair it with the PS3 system via a USB cable (Type A – Mini-B). Sleek curved body design that easily pairs with the Move motion controller. Nine months ago, Point Man and his F.E.A.R. squad were tapped to stop a telepathically gifted cannibal who had begun a murderous rampage. Point Man learned the target was his brother, Paxton Fettel, working alongside their tortured and psychically powerful mother, Alma Wade. Despite this revelation, Point Man followed orders to destroy them and subsequently ravaged the surrounding city and most of his F.E.A.R. team. Now, it is clear that Alma’s psychic influence survived- and worse, she is about to birth something that could destroy the world. Fettel has returned from death with an unclear agenda, refusing to leave Point Man’s side and asking for help to reach Alma. The remaining F.E.A.R. squad is still trying to complete their mission. With his chain of command broken and Point Man calling his own shots, where will his allegiance lie?